Caroline graduated from the University of Pretoria, South Africa in 1999. After working for 18 months in private practice in South Africa, Caroline decided to move to England to broaden her horizons both professionally and personally. Caroline has been working in General Dental Practice in Hertfordshire since 2000 and started at Smilecraft in 2010. Caroline is a past member of the Local Dental Committee which ensures local dental standards are maintained and has taught dental nurses at the Queen Elizabeth II Hospital. She has also been the chair of the North Hertfordshire section of the British Dental Association and served as secretary of the Border-Kei branch of the South African Dental Association. 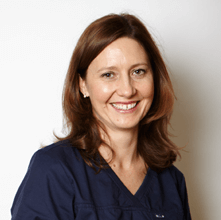 She thoroughly enjoys all aspects of general dental practice and has a compassionate nature which is greatly appreciated by our more apprehensive and younger patients. Her outside interests are family, travel, swimming, ballet and wildlife.